Kensington, Brooklyn: KWT CSA in the News! We've joined the CSA and have so far had a great experience with it. We truly are amazed at the core groups commitment and have enjoyed meeting some neighbors through the group. We are also really surprised at the amount of people who joined this year and think its a real testament to the changes happening in the neighborhood. We hope some of those vacant shop locations take notice of this growing group too! 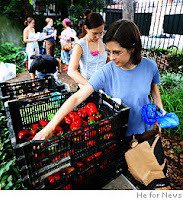 Gina Duclayan, founder of the new Kensington-Windsor Terrace CSA group in Brooklyn, said the trick is making sure your share isn't bigger than your stomach. She and her husband signed up for a half share this year. "If we got a full share, we'd have things rotting," she said. Her group has 101 members in its first year - a success that shocked even the farmers, who found themselves caught short in their henhouse. Their excuse was one you wouldn't likely hear at the corner store or at Whole Foods. "They asked for people to sell back egg shares," Duclayan explained. "They weren't producing enough - and there was a weasel attack."